It seems everyone is in Cape Town right now. Henerik Jamaer brother of pro Leon Jamaer is no exception, check out this clip as he tears up some sweet South African Waves. Andy McKinney of Wind-NC heads out in some crazy Hatteras, North Carolina winds. Saturday, January 25th went pretty ballistic out here on Cape Hatteras, with winds gusting up towards 40 knots. Maxed out 3.6, I took a short sesh and just kept it simple out there. Filmed with a Soloshot from the safety of the truck. Professional windsurfer Yannick Anton windsurfs big waves in Fuerteventura and shows how to live sustainable on the island. Yannick is one of our ambassadors against oil drilling and also windsurfs for the Clean Ocean Project. Help us to fight for renewables against oil in Canaries. Sign the petition at savecanarias.org and support our athlete videos at theVibes.tv / environment. We have the power. Yes to renewables, no to oil drilling in Canaries. In 2013 Marcillio Browne wrapped up the PWA World Tour on the top of his game. 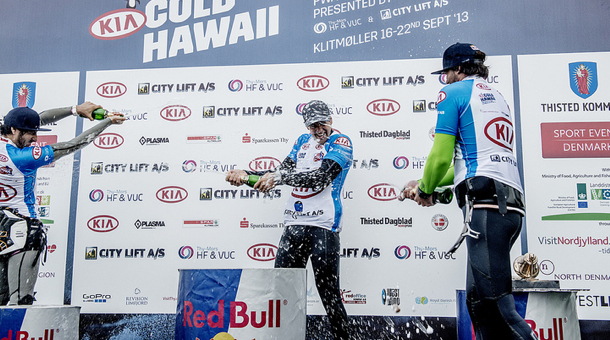 At thelast event of the season, the Aloha Classic, he became the 2013 Wave World Champion. Earlier in the season he also won the PWA World Cup event in Denmark, and is still in the hunt for the Red Bull Storm Chase. This amazing clip by Arthur Miranda highlights the 2013 season of this Brazilian ripper. Enjoy! Mattia Pedrani brings us a mashup of 5 differenet session he had over the past Christmas during a quick trip to Sardinia. Italian freestyler Jacopo Testa has in Brazil for a little mix of freestyle and wavesailing, check out his clip from Sao Miguel Do Gostoso. Check out this clip and enjoy the great down the line action from Boujmaa Guilloul, at one of his favorite spots in Morocco, Cap Ghir. Victor Fernandez brings us into his recent trip to Chile with some action packed riding. Philip Koster is back home in Gran Canaria after his exploration down under. Check out his latest clip as he rips up Salinas.